Summer is in full swing here in Central Florida. The sky is blue, the grass is green, and boy is it hot. This is the time of year for picnics, backyard barbeques, pool parties, and the consumption of large quantities of icy beverages. Most people go for either tea or lemonade in the summer, and I have a tendency to like unusual flavor combinations. So I decided to share with you some of my favorite lemonade recipes for the summer. There is one important thing to note when making lemonade. Adding lemon juice (or really any citrus) to hot water brings out the bitterness, so always add the lemon juice after any warm ingredients have already chilled. Who knows, you might even be able to lessen your honey/sugar by doing this. 1. My husband loves watermelon in the summer, and what better way to cool down than to have your favorite summertime fruit in your lemonade? Maybe by adding some cucumber. 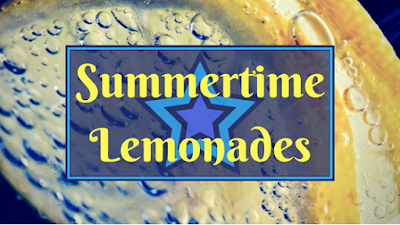 So here is one of my favorite summertime lemonade blends. Combine the first 4 ingredients in a blender and blend well. While blending, heat 1 cup of water in a saucepan on the stove. Add in the honey and stir until dissolved. Remove from the heat and mix with 5 cups of chilled water to cool. Add the honey and water mixture to your blended ingredients. Mix well. Chill for 1 hour before serving. *Optional, try using Soda Water (or Seltzer Water) instead of the chilled water for a fizzy treat. 2. Green Tea and Lemonade are a classic mix. Add in a bit of refreshing Mint and you have a great summertime drink! On your stove, bring 4 cups of water to a boil. Add in honey and stir well to incorporate. Remove from heat and add in the mint leaves, matcha powder, and lemon zest. Whisk to incorporate, cover and chill in the refrigerator for about 30 minutes. Once this mixture has chilled, add in remaining ingredients and place back in the refrigerator for 1 hour before serving. 3. I love lavender and how it helps all of us to relax. Lavender and lemonade are a summertime no-brainer for relaxation. But how about adding in a fruity punch by way of peaches? Mmm tasty. On your stove, bring 4 cups of water to a boil. Add in honey and stir well to incorporate. Remove from heat and add in the lavender flowers. Cover and allow to come to room temperature (about 30 minutes). Strain and pour over the diced peaches and lemon zest. Chill in the refrigerator for 30 more minutes. Add in the lemon juice and remaining water. Mix well and chill for 1 hour before serving. *Optional, for a spicy alternative, use 2 tsp fresh ginger in place of the 4 tsp lavender. 4. Coconut is the flavor of the tropics. And what better way to spend our summers than at the beach? This lemonade is refreshing and helps us to imagine our toes in the sand, and the sound of the waves. Combine first 4 ingredients in a blender and blend until smooth. On your stove, bring 1 cup of water to a boil. Add in the honey and stir to well to incorporate. Remove from heat and combine with 55 cups of chilled water to cool. Add the honey mixture to the blender and incorporate. Chill for 1 hour before serving. *Optional, use pineapple instead of kiwi for a Pina Colada Lemonade. 5. I am not a big fan of grapefruit. That being said, there are some flavor combinations that I love that just happen to star this bitter citrus fruit. Grapefruit and Rose are one of those combinations. I can't seem to get enough of it. So I turned it into a summertime lemonade. Why not? Combine first four ingredients and mix well. honey. Stir to incorporate. Remove from heat and add to 5 cups of chilled water. Once cool, combine with other ingredients and chill in the refrigerator for 1 hour before serving. *Optional, throw in a few teaspoons of dried rose petals just before serving. In any of these recipes, feel free to change the ingredients around. Play with different herbs and fruits. Try using pineapple juice, lemongrass tea, or hibiscus tea instead of lemon juice. Throw in a handful of fresh berries, or pomegranate seeds, to any of these recipes and see what happens. Have fun, play around, and let me know what you think below!